It seems pizza restaurants all over are hopping on the gluten free bandwagon and offering gluten free pizza...but if you're Celiac or gluten sensitive, it's important to ask the right questions before blindly devouring any "gluten free" pizza. After all, we've all heard the stories about cross contamination rendering supposedly "gluten free" pizzas unsafe for consumption -- except for those folks following a gluten free diet by choice. Pizza Pie Cafe is one place you can feel safe. If you live in Idaho or Utah, you have 11 Pizza Pie Cafe locations to choose from (and they'll be opening another one -- in West Jordan, UT -- in mid-February). Apparently, further expansion is planned as well. They follow safe practices to avoid cross contamination, including keeping the gluten free pizza crust in its own separate pan during preparation and cooking, using separate sauce and a separate ladle, changing gloves, and using a separate pizza cutter. Pizza Pie Cafe offers a gluten free version of its All You Can Eat pizza, pasta, and salad bar. And they will make ANY gluten free pizza (whichever combination of toppings you like), upon request. Even though there's a $2 upcharge for gluten free, it's a great deal -- $9.25 for the lunch buffet and $10.25 for the dinner buffet (those prices include the upcharge). Choose from Marinara, Meat Marinara, and Basil Pesto sauces for the pasta -- and even a gluten free BBQ sauce for some of their pizza combinations. And how many places do you know that offer a gluten free DESSERT PIZZA? Pizza Pie Cafe does -- and it's part of this great buffet. WIN A FREE $25 GIFT CARD TO PIZZA PIE CAFE! Yep, you heard it right...just dine at ANY of Pizza Pie Cafe's 11 locations and submit a review of your gluten free experience at that particular location to GlutenFreeTravelSite, and you'll be automatically entered into a random drawing for a $25 Pizza Pie Cafe gift card. Let us know what you thought of Pizza Pie Cafe's gluten free pizza, pasta, and salad bar! One winner will be chosen by a random drawing from all entries (review submissions) received by GlutenFreeTravelSite by 11:59 pm Eastern time on Friday, January 10, 2014. 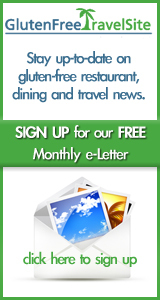 So make a point of visiting a Pizza Pie Cafe in the next few weeks, and share your review on GlutenFreeTravelSite.